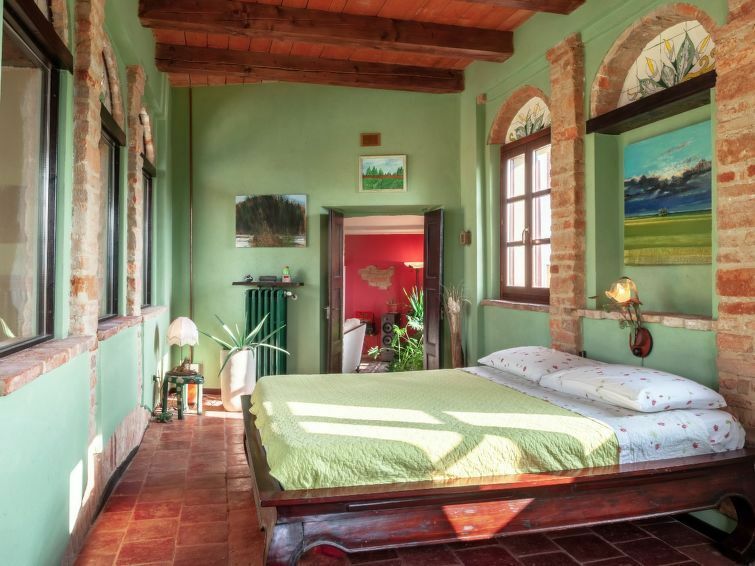 Old small apartment house "La Dolce Vite", 300 m a.s.l., from the 17th century, renovated in 2012. 10 km from the centre of Moncalvo, excellent location: right in the centre but still quiet. For shared use: property 200 m2 (fenced), swimming pool (8 x 4 m, depth 150 cm, 01.06.-30.09.). Outdoor shower, terrace (20 m2), barbecue. In the complex: sauna (extra). Washing machine. Public parking on the road. Grocery 500 m, restaurant 800 m. Riding stable 5 km. Nearby attractions: Asti 16 km, Casale Monferrato 36 km, Alba 45 km, La Morra 58 km, Barolo 60 km. Please note: car recommended. The owner lives in the same residence. "Suite", 2-room apartment 85 m2 on 2 levels, on the ground floor. Rustic and cosy furnishings: kitchen (4 hot plates, microwave, freezer, electric coffee machine) with dining table. Upper floor: living room with open-hearth fireplace. 1 double bedroom with satellite TV. Exit to the terrace. Bath/bidet/WC. Gas heating (extra). Heating available only from 15.10. to 15.04. Terrace. Terrace furniture. View of the swimming pool. Facilities: Internet (WiFi, free). Please note: 1 pet/ dog allowed. Private entrance.